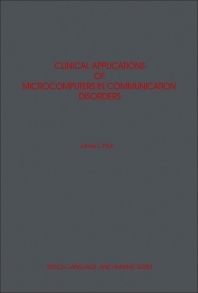 Clinical Applications of Microcomputers in Communication Disorders is a comprehensive reference for the utilization of microcomputers in the field of communication disorders. The human-machine interface is discussed, along with word processing and data processing. The use of the microcomputer in the diagnosis and treatment of speech-language pathology is also reviewed. Comprised of 13 chapters, this book begins with a historical perspective of the computer in society and its role in the field of communication disorders. The reader is then introduced to computer hardware and software, and computer languages are described with examples written in BASIC. Subsequent chapters focus on the challenge that society faces in learning to live with technology; word processing and data management; and specific applications of the computer in the fields of speech-language pathology and audiology. Programs that are either commercially available or are in the public domain are reviewed. The final chapter paints a picture of the clinic of the future and the role that will be played by the computer. This monograph will be a useful resource for clinicians and other practicing professionals in the fields of speech pathology and audiology, including those who have an interest in, or need to stay current with, developments in the clinical management of communication disorders.